Honest or not honest, that IS the question! I am reading “Lila” by Robert Pirsig and he talks about the way the American Indian plains-people tend to speak from the heart, with no attempt to hide or wrap things up in clever or manipulative language. As a fan of assertive communication, I think this is brilliant: Just try to say exactly what you really feel and really mean. But Pirsig also adds that American Indian people choose well the moment to speak honestly… and I think this may be a weakness for me. Example: My mother asked my years ago “How was dinner?” I replied “I enjoyed it thanks. I found the chicken a little dry, but with the sauce it was great”. This was clearly a fault – I lacked some emotional intelligence – I needed to learn when to keep my mouth shut, not to criticise to quickly. Example 2: I share constantly my ideas with people on how they could do their business better, even if they are in the same business as me. Example 3: I try to make everyone happy first, rather than trying to win for myself first. Example 4: I explain by email to a client WHY I did something differently than planned, thus opening the door for disagreement where my actions may have simply been accepted “as-is”. When I was a younger trainer, I used to tell people that it was best to play WIN:WIN (blue). Now I don’t say such things. (First of all, I have a tendancy to get them to figure it out and decide for themselves, secondly ….) 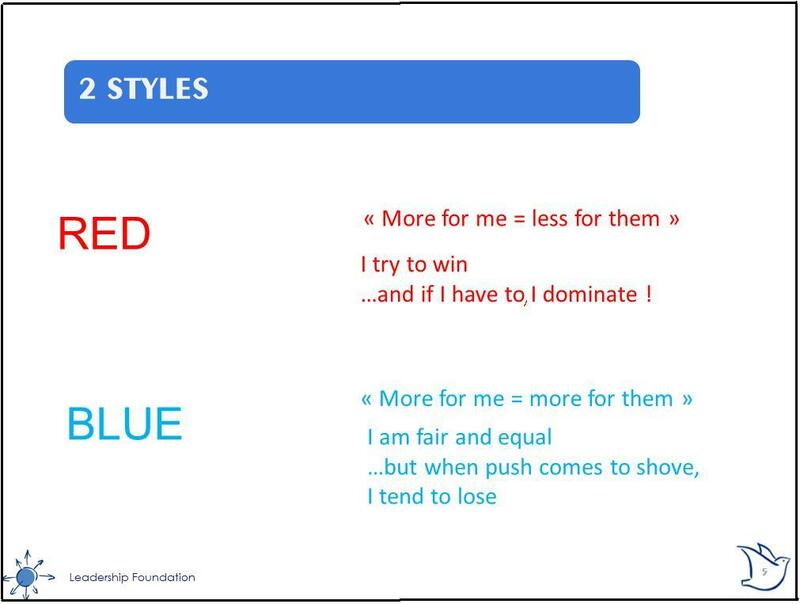 I would prefer to say that one needs to have a preference for WIN:WIN, but be aware and open to when it is time to be a little more “red”, notably when others are playing “red”. And so, I think today that sometimes I should not be so nice, so open, so clear and direct. I can still value these things, but NOT DOING THEM ALL THE TIME is not equivalent to being not-nice, dishonest or indirect. Just discrete or less naive or strategic. (“Purple”, as Gavin Kennedy would say in “The New Negotiating Edge”).